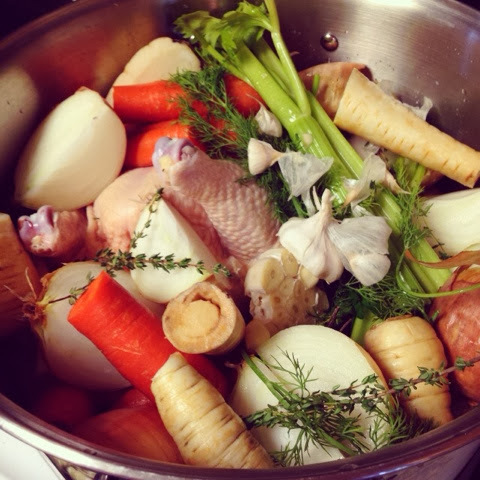 Want your chicken soup to have true healing powers? There is nothing. Nothing. Better than homemade chicken stock. ...ok, so maybe that's a little dramatic. There are better things in life... But if you pride yourself as a decent cook, this is definitely a bucket list item. The great thing? It really doesn't even take that much effort. It mostly just takes a really big pot. We've tried a few different stock recipes and it is certainly something that you can customize according to your own flavor preferences but for us, Ina Garten has it down. Place the chickens, onions, carrots, celery, parsnips, parsley, thyme, dill, garlic, and seasonings in a 16 to 20-quart stockpot. Add 7 quarts of water (or enough to cover everything) and bring to a boil. Simmer, uncovered, for 4 hours. After an hour of simmering, you can remove the chickens and remove the meat from the bones to use in other recipes (like chicken soup!). Return the bones back to pot for the remaining three hours. Strain the entire contents of the pot through a colander and discard the solids. Chill the stock overnight. The next day, remove the surface fat. Use immediately or pack in containers and freeze for up to 3 months. Did your stock get a little jelly overnight? Pat yourself on the back! That means you've got a super rich stock! I know I freaked out the first time I ran into that. It's not fat. Collagen in the bones gets drawn out the longer you let it simmer. Update- Was doing better eating less but these last two days have been bad. Bought some cookies for a special occasion but ate way too many. But they are gone now and I won't buy any more. Need to stop eating chips too.